Whether you are visiting Park City for a week or staying a lifetime you absolutely need to attend the concerts at Deer Valley’s Snow Park Amphitheater. Just as summer starts to sizzle, Deer Valley hosts a variety of concerts that will accommodate everyone’s musical taste and budget. Personal coolers chock full of snacks and beverages are welcome and it’s a come-as-you-are dress code. This season’s lineup is not to be missed, so grab your tickets and check out our guide to making your Deer Valley Concert experience unforgettable. 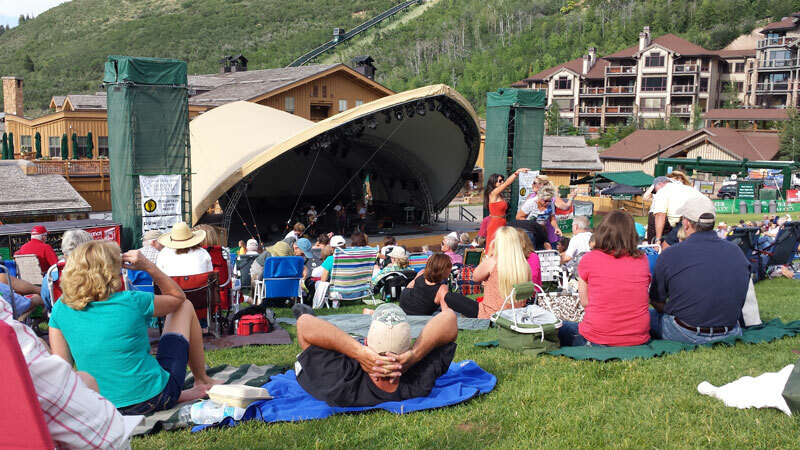 There are a few different concert series that call Deer Valley’s Snow Park Amphitheater home. First, the Deer Valley Music Festival pairs our own Utah Symphony with the best of rock, country, pop and more. Fun pairings for the 2017 season include The Beach Boys, The Music of Prince, and Diana Krall. (I have tickets to all 3!) Ticket prices vary. Brought to us by the Park City Institute, the Big Stars, Bright Nights concert series is where the big stars come out, both literally and figuratively. This year, be sure to check out Aloe Blacc, Melissa Etheridge and Punch Brothers. Ticket prices vary. The Grand Valley Bank Community Concert Series is one of the best ways Deer Valley Resort can say “thank you” to the community for a great winter ski season. These free concerts feature the best local bands and are a favorite of locals and visitors alike. No admission fee. A fabulous concert experience isn’t all about the gear, but being prepared will ensure you have a much better experience. 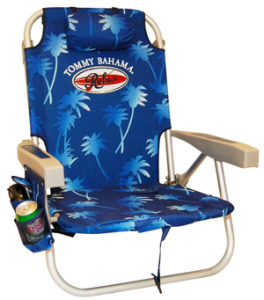 We love the the Tommy Bahama Backpack Cooler Chair. For about $99 you can pick up a pair on Amazon. They are lightweight and easy to carry with the two backpack-style straps. There is an adjustable pillow, an insulated pouch for food and drinks and a small side pouch for your phone and keys. Deer Valley also sells a similar chair in their Signature Stores. If you plan to become a regular concert goer, these chairs are a great investment. I’ve had my Deer Valley chairs for over ten years. They are easily stored in the garage on hanging hooks in the off season. Chairs in general admission may not have a seat that is over 9” above ground while the reserved section can only be 7” above ground. The Tommy Bahama and Deer Valley chairs are fine for both. For the true concert picnic enthusiast and wine lover, here’s a real insider’s tip. Do not try to manage your wine and wine glasses without those nifty little stainless steel holders to keep your bottles and glasses upright. You simply stab one end of the stake into the grass and you can sit back and sip worry-free. Pro tip learned the hard way: don’t forget the corkscrew. While we don’t want to discourage any fashion statement we do want to recommend sturdy shoes. High heels look nice but just don’t work while attempting to hike up a 20 degree slope. Also, mud can be a factor and I have found myself slipping even in flip flops. As for weather, be prepared for typical mountain evening variations. You may be sweating while you’re walking up the hill and settling into your chair or picnic blanket. However, once the sun drops behind the hill it will get chilly very fast. My husband and I learned this during our first concert when we were shivering beneath our cloth tablecloth and napkins. Bring blankets, puffy coats or sweaters to keep yourself comfortable once the stage lights come on. Trust me on this one. The temperature can drop twenty degrees in a matter of minutes once the sun sets. Deer Valley sells gourmet picnic baskets which serve two. They can be ordered by phone or online. Orders must be placed by 5:00 p.m. the day prior to the event. There are concessions at the venue with expanded options like children’s picnic bags, sandwiches, burgers, salads and more. Takeaway items are available at the nearby Deer Valley Grocery Cafe. If you’re coming from Salt Lake or Kimball, Kneaders also offers wonderful boxed meals. They typically include half of a sandwich, salad, chips and a dessert. I have also had success with a quick stop at Whole Foods on my way to Deer Valley. If you’ve got a bit of time before the Grand Valley Bank locals concerts, you can head over to the Park City Farmer’s Market each Wednesday from 12:00 noon to 6:00 p.m. There you can shop for picnic staples like fresh baked bread, locally crafted cheeses, fruits, and veggies. The Snow Park Amphitheater and Lodge are conveniently located on the complimentary Park City Bus line. Parking is free, but if you do plan to drive allow ample time to park and walk to the venue. Also, don’t drink and drive. Carpooling, Uber, taxi or use of the free transit system are highly encouraged if you plan to imbibe. If you’re the adventurous type and plan to bike, there are many bike racks to park and lock your bike. Here is another insider tip if you are in the general admission section: have one person drop off chairs and picnic blanket while the other parks to ensure a better spot. Those backpack strapped chairs make it easy for one person to carry multiple chairs to reserve a choice spot. Summer is short in Park City. There are tons of concerts packed into July and August. So get geared up, secure some supplies and you are ready to concert at Deer Valley like a pro. I hope to see you there!